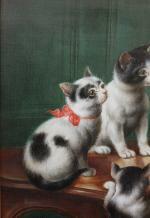 Masterfully animal genre painting was created on the turn of 20th Century. The work was signed by the artist "J.Hartung", famous pseudonym of Austrian animale painter Carl Reichert (1836 Vienna - 1918 Graz). His works situated in the best animalistic collections around of the world. He was a son of painter Heinrich Reichert and brother of Prague theater painter Heinrich Reichert. Studied at the Drawing Academy in Graz by J.Tunner and E.C. Moser, later by J.Kuwasseg. From 1866 till 1876 he lived in Munich and Rome. Here he worked with Anton Romako and Johann Passini. 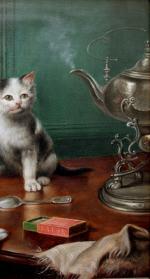 From 1869 to 1910 he lived in Vienna , where were created his best dogs and cats genre paintings. Since 1874 - Member of Vienna Artist Union "Künstlerhaus". Other works by C.Reichert see under item numbers : 928; 940; 964; 1043; 2338; 3027; 3259; 4235, 4426, 4591. Literature: Prof.H.Fuchs " Die Österreichischen Maler ", Vienna, 1975. Inscription: signed with pseudonym J.Hartung lower right, on the backside-original artist‘s title in German“Teegesellschaft" (in English: Tea society).